How Do I Get My Whirlpool AC Unit to Work Without a Remote Controller? Many Whirlpool in-room air conditioners include a remote control that can be used to select the mode like "Cool," "Fan" or "Power Saver" from across the room. Other settings include the "Power" function, and the speed such as"Turbo," "High" or "Low." Temperature can also be adjusted by pressing a plus or minus button. Some remotes have timer functions, too. The remote control is powered with two AAA batteries that are included when the AC unit is shipped. If the batteries have become depleted, or you've lost the remote control, you can operate Whirlpool AC units without a controller. 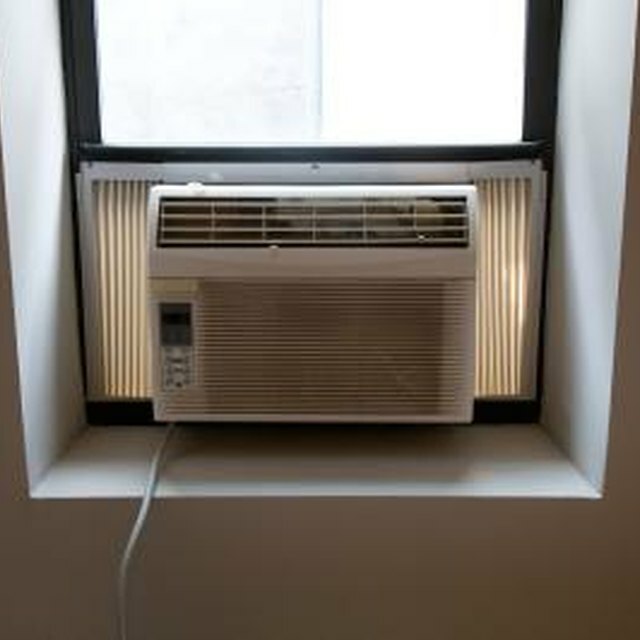 Many Whirlpool in-room air conditioners include a remote control that can be used to select the mode like “Cool,” “Fan” or “Power Saver” from across the room. Other settings include the “Power” function, and the speed such as“Turbo,” “High” or “Low” Temperature can also be adjusted by pressing a plus or minus button. Some remotes have timer functions, too. The remote control is powered with two AAA batteries that are included when the AC unit is shipped. If the batteries have become depleted, or you’ve lost the remote control, you can operate Whirlpool AC units without a controller. Identify the control panel on the front of the AC unit. It’s on the bottom right side of the fascia. If the AC unit is off, the ambient temperature will be displayed on the panel. Press the “Power” button to turn on the AC unit. If there’s nothing displayed on the panel, the power is disconnected. Plug the Whirlpool AC unit into the wall outlet. Choose the “Mode” function using the “Mode” button just like you would on the remote control. Then, choose the “Fan Speed” and the “Temperature” with the panel buttons. Set some of the other settings that you would have operated with the remote control. Choose “Timer” on the panel to set the time before the unit will switch off. Press the “Plus” button to increase the delay and the “Minus” button to reduce it.